2 brand new cars! Beat your friends’ records. 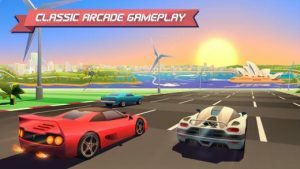 Horizon Chase is a PAID game, but you have the opportunity to try it before you buy. Enjoy 5 tracks and 2 cars for free to experience one of the BEST OF 2015. Try it before you buy: enjoy 5 tracks for free! … and that is about it. Controls are questionable at best. My favorite is the auto accelerator option where you can tap anywhere to brake including the steering buttons and the nitro. This becomes a problem when you are essentially racing against 19 other competitors who are not racing each other leaving them to block you, push up you off the road, and always seem to just happen to drift right over into your lane. These problem only are made worse by the fact that almost every curve is blind especially to the next curve. This would be made much better by simplifying the tracks to match the graphics, not pretending we have made the next Gran Turismo. I enjoy this game. It definitely has an Outrun / Rad Racer feel about It. I like how you can use the nitro boosts even after you’ve run out of fuel — which frequently gets me out of trouble. However, the Facebook integration seems to be broken. I’m also not particularly thrilled about tracks where you basically cannot see anything without turning the device’s brightness up to about 75%. Multiplayer support would give this game some added life even after you’ve beat all tracks.